A man has been found guilty of fatally stabbing another man in a "petty dispute" about money. Gavin Singleton, 31, was stabbed in the chest and leg in Walkley Lane, Sheffield, on 23 September and died in hospital on 6 October. 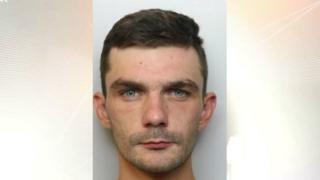 Danny Trotter, 24, was found guilty of murder after a six-day trial at Sheffield Crown Court. Trotter, of Chadwick Road, Sheffield, was also found guilty of wounding a second man and will be sentenced later. The court heard Trotter and Mr Singleton had arranged to meet on Saturday 22 September and were seen together on CCTV near to the Rawson Spring pub in Langsett Road. Shortly after midnight an altercation broke out between the two men and Trotter was seen to lash out at Mr Singleton and walk off. As Mr Singleton tried to walk away he collapsed in the street, having been stabbed three times. Trotter initially denied the offence but later claimed he had been acting in self-defence after the two men had rowed about money. Det Ch Insp Jude Ashmore said: "What amounts to a petty dispute over a relatively small sum of money has resulted in a man losing his life."